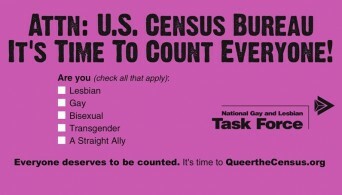 The U.S. Census Bureau announced on Friday it has established a new advisory committee to ensure its programs and surveys — including the once-a-decade census – accurately reflect LGBT and other minority populations within the country. The National Advisory Committee on Racial, Ethnic & Other Populations is comprised of 31 members and is set to advise the bureau on issues such the cost, accuracy and implementation of surveys. According to a news statement, these members are experts in topics ranging from housing, children, youth, poverty, privacy, race and ethnicity to LGBT populations. Among the committee are experts on LGBT issues: Charlotte Patterson, a psychology professor at the University of Virginia who has researched child-rearing in LGBT households, and Shane Snowdon, head of the LGBT health and aging at the Human Rights Campaign. Posted October 13th, 2012 & filed under News.